Data recovery by type - The last and best hope, the super knowledge and skill for data recovery! Normally two types of methods can be used for data recovery by software. One is lost partitions recovery, the other is file recovery, including deleted file recovery and formatted file recovery. The method of lost partitions recovery is mainly used when you delete the partitions by mistake or the entire hard disks are Ghost into a partition by mistake, etc. In brief, this method can be adopted when you can't find the original partitions in disk management and it is your first choice to recover by using "PartitionGuru" software in the circumstances. The method of file recovery is mainly used when the partition tables are in good order, the partitions are not lost and only the internal structures of the partitions are destroyed. The premise of successful dada recovery is to keep the file directory in order or destroyed not seriously, keep the file data uncovered or covered slightly. If so, normally the file names and the hierarchical structure of the file folders can be recovered by running the data recovery software for scanning. However, considering this type of data recovery is more complex, if the destruction were more serious, partitions might not exit, it might fail to recover the lost partitions by using "PartitionGuru" software. 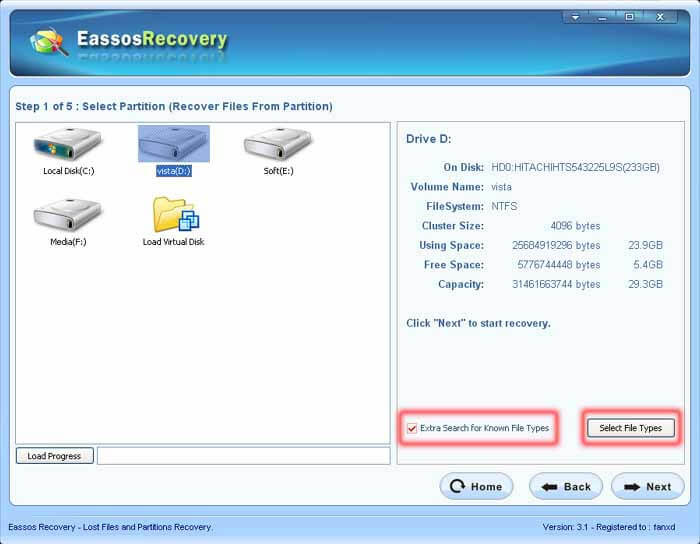 At this moment you can use the "recover the whole disk file" function of "Eassos Recovery" software, after scaning, it may find and display all partitions and files. The premise of successful dada recovery is to "keep the scene intact" after lost data. However, A majority of inexperienced computer user just remember looking for data recovery software or seek professional help after "contaminating the scene" in varying degrees. In practice we often encounter such very serious situations. The directory structure within the partitions are destroyed too seriously to find the file name and file size, at this time "file recovery" function will fail, any useful files can't be found after scanning. For instance, the user formatted the partition of dozens of GB size which had been filled with the data previously, and then copied several GB files in this partition. After such operations the user suddenly realized the original data was very important but no backup. In view that the directory structure and files relevant important information have been destroyed, it will be no effect by using the above two methods. Under such circumstances, as the file name and directory levels can't be recovered, the only thing to do is to recover on basis of file data analysis, that is to say "data recovery by type", which is this article focusing on. "Recovery data by type" is to analyze the data stored in the disk sectors and to ascertain the file type and size according to the file data so as to achieve the purpose of data recovery. Normally the file data is stored continuously on disk, which makes successful recovery by type possible. In addition, although the file name fails to be recovered due to the directory structure has been damaged, if the algorithm is proper, file type, file data and size can be perfectly recovered. In other words, the specified type data can be recovered and the file contents can be seen after opening via some software. 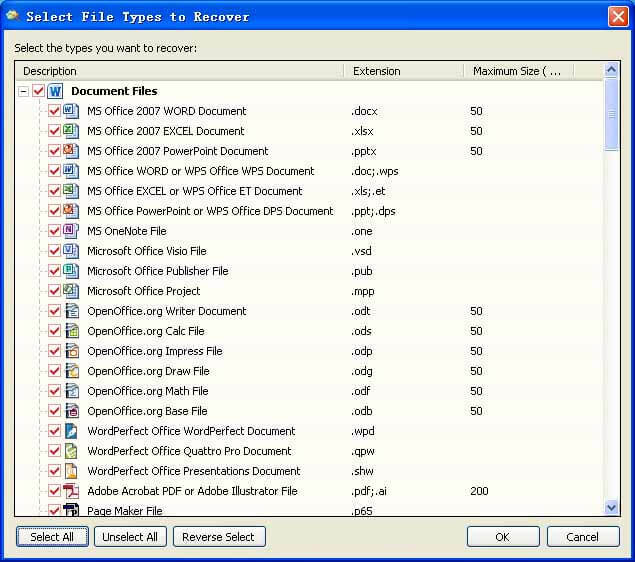 As to the document files such as Word, Excel and photographic files, etc., such recovery results are acceptable and satisfied. We call "data recovery by type" as "the last and best hope" in view that it is the ultimate solution in such serious situations, should the above two methods fail, we have no option but to recovery by type. So, how to recover by type? How to ascertain the file type and size? In fact, any type of files is stored according to own, fixed format and different software use different format to save files. However, generally the same file extensions have the same storage formats. Such as GIF format image file, always with "GIF89a" or "GIF87a" as a beginning, then a data structure which records the breadth and height of the image and other information, and then color table data and each image data (a GIF format files may be composed of multiple photos). In the process of scan disk, when finding a sector in the beginning of "GIF89a" or "GIF87a", we can make sure this is the beginning of a GIF format files, then we analysis the data structures, the color table size, and then analyze each image data till the end of file. GIF format image data are compressed and the size of the compressed block is saved in front of every compressed block. A GIF format file can be recovered perfectly after replicating all these data. Certainly the structure of each type of the file data is different. In order to recover this type of file, you should know its file structure. Should we find the type mark like "GIF89a" by scanning, we can ascertain the file type. Further analyzing the structure, we can ascertain the file size. So it is very high requirements for the software developers to achieve such a function for perfect data recovery. It is required not only to understand the different types of file format, but also to take relevant algorithms for the different types. Although at present many data recovery software have such functions, we can obtain the different recovery effect by using different software due to algorithm discrepancy. For example, some software support many file types but hardly ascertain the size of the file correctly, some file is very big after recovery and is required to cut short by user self. 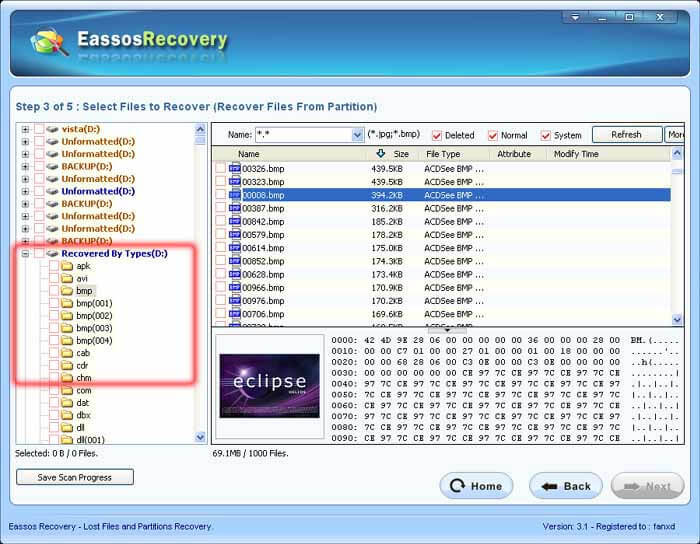 Herein we'll take "Eassos Recovery" software as an example to introduce the method to recover the files in the partitions by type. The file types supported by "Eassos Recovery" software are not very much but almost the common file types, and the advantages of this software is to ascertain the file size more accurately, which reduces many trouble for users. In order to imitate the case which the partitions are destroyed very seriously, we specially reset the directory structure of the partitions which we intend to recover so that directory structure is destroyed and we can't recovered by other methods except "recovery by type". 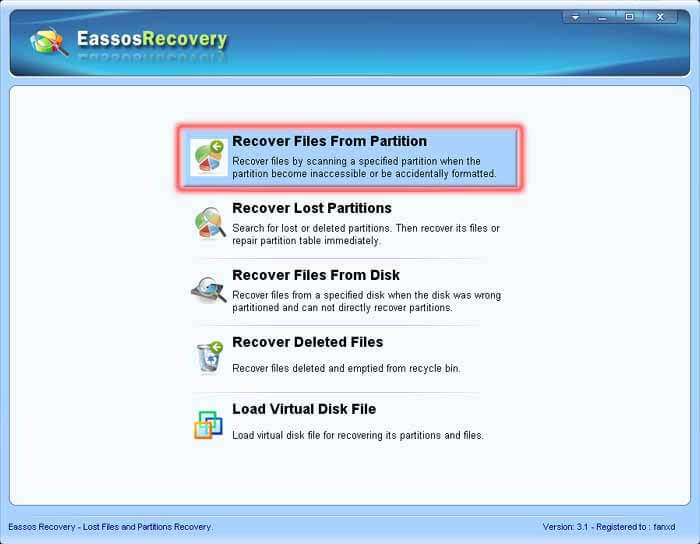 First, please run "Eassos Recovery" software, choose "Recover Files From Partition" in main interface. Don't choose the types you don't need for recovery to avoid slow the scanning speed. As to some types, you can set up the maximum size of the recovered file, which may be used when the program can't ascertain the file size. But not all types need to set up the maximum size. While you set the types of maximum size, the file size might be ascertained in practice. Only when the file size can't be ascertained, the program will use this which you choose. Please click "OK" after choosing. The software has found a single partition (called "Recovered by type") to show all types of files and each type files have been shown in corresponding type directory. For the image and text file, the thumbnails can be seen after clicking. From the above, we can find all file names have been changed to serial numbers and all files which originally were in various directories have been classified by type. As discussed above, it is caused by the directory structure damaged.